According to researchers, people who are exposed to greater levels of air pollution where they live have a greater risk of developing diabetes, as well as several other health conditions. Modeled PM 2.5 concentration in the Augsburg area. 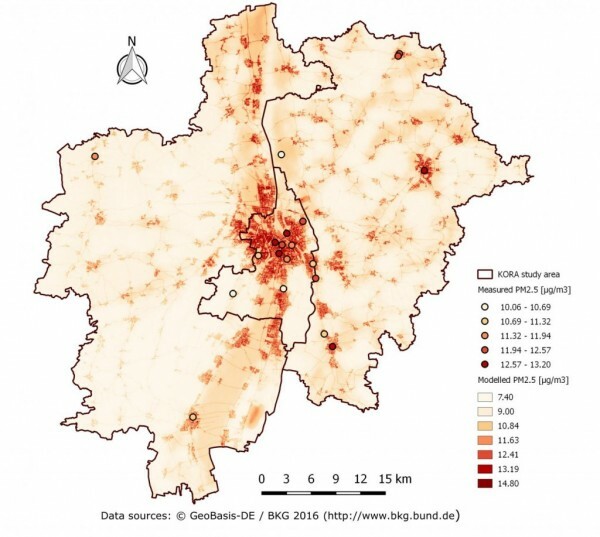 “Whether the disease becomes manifest and when this occurs is not only due to lifestyle or genetic factors, but also due to traffic-related air pollution,” said Professor Annette Peters, director of the Institute of Epidemiology II at Helmholtz Zentrum München and head of the research area of epidemiology of the DZD. For the current study, she and her colleagues in collaboration with German Diabetes Center Düsseldorf and the German Heart Centre analyzed the data of nearly 3,000 participants of the KORA study who live in the city of Augsburg and two adjacent rural counties. In addition, leptin was examined as adipokine which has been suggested to be associated with insulin resistance. Non-diabetic individuals underwent an oral glucose tolerance test to detect whether their glucose metabolism was impaired. The researchers compared these data with the concentrations of air pollutants at the place of residence of the participants, which they estimated using predictive models based on repeated measurements at 20 sites (for particle measurements) and at 40 sites (for nitrogen dioxide measurements) in the city and in the rural counties. The authors are also concerned that the concentrations of air pollutants, though below EU threshold values, are still above the proposed guidelines of the World Health Organization (WHO). Moreover, the association between increased exposure to air pollution and respiratory and cardiovascular diseases has now been clearly established. Next, the scientists want to investigate the influence of ultrafine particles. “Diabetes will be a main focus of our research, also in this context. A precise knowledge of the risk factors is crucial for counteracting the increasing incidence of diabetes,” said Peters, looking to the future. Background: A previous study of Helmholtz Zentrum München from 2013 showed that ultrafine particulate air pollution increases the risk of insulin resistance in childhood. In a meta-analysis from 2015 the same authors concluded that there is an association between long-term exposure to air pollutants and the development of type 2 diabetes.